We’ve been in Europe since the end of May, just now returning to our temporary home-base of Minneapolis, where working on my PhD has somewhat slowed down my more casual writing projects. I’ve only published two installments of Sound Propositions in the past year (with Mark Fell and Kate Carr), contributed occasionally to CULT MTL, and seen my contributions to ACL drastically reduced. Though I have more or less kept the mix series running, and I was also able to produce a mix for S13 I’m very proud of, in addition to an album of field-recordings for the CATHEDRALS project, my musical output has also been diminished. I have a number of musical projects and long-form essays in the works, few of which will see the light of day before the end of the year. I did, however, recently publish this short essay on Matana Roberts for .dpi, the Montreal-based Feminist Journal of Art and Digital Culture as part of a special issue on Music & Politics edited by my friend and collaborator Esther B. Initially my plan was to write about feminist currents in England’s noise and industrial scene of the early ’80s, riffing on the more political performance art dealing with labour and sexuality in the 1970’s, but this project necessitated more research than I had at first planned. I had just received my copy of Matana Roberts’ River Run Thee on vinyl while I was figuring this out, and realized it would be the perfect focal point to express some frustrations that had emerged when working on a related longform article on the Nurse With Wound list the prior Fall. That article will be published eventually, somewhere, but the short of it is that the infamous list has emerged in the age of the mp3 blog as a kind of outsider music wishlist, and inherently posits a genealogy of experimental and avant-garde music that takes on greater significance in hindsight. When it first appeared in 1979, the now standard history linking the Art of Noises to John Cage to musique conrète to Stockhausen to Fluxus to psychedelia to Krautrock was quite novel. What bothered me was the near complete absence of black musicians (Sonny Sharrock being the sole exception of a lead artist) and women (Yoko Ono being the most prominent). It may have been too early for them to have encountered an understood the importance of Dub music or Hip Hop, but how could these guys, self-proclaimed fans of free jazz, include artists from labels like ESP-Disk’ and Black Saint but still fail to include any artists hinting at the important influence of black radical music? Where are artists and ensembles like Albert Ayler, Sun Ra, Anthony Braxton, the Art Ensemble of Chicago and the AACM? I wanted to explore the tendency of the Euro-American avant-garde towards negation and silencing, which has the effect of marginalizing social and cultural expressions in favour of abstraction and formal concerns. At the same time I don’t intend to accuse NWW or Steven Stapleton of any malice, and think that it is worthwhile to consider the impact of that list and Stapleton’s surrealist-collage aesthetic. 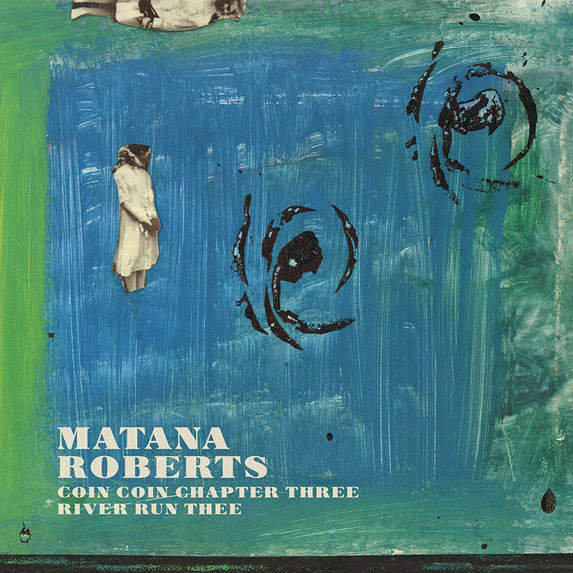 I’ll be addressing some of my concerns in an article on alternative histories of electronic music for next year, but in the meanwhile was able to begin to articulate some of those themes in this essay on Matana Roberts’ excellent new LP, River Run Thee. Fifty years after the assassination of Malcolm X, Matana Roberts mines her ancestry and the history of the Americas to produce a compelling and mournful counter-narrative that resonates deeply with contemporary struggles. Roberts’ latest album, River Run Thee, foregrounds the same collage aesthetic on display in her visual art. Perceptible in her earlier ensemble work for those who could listen beyond the jazz instrumentation, this third installment of her projected 12-chapter epic COIN COIN may finally help her transcend the inadequacies of the jazz label and refocus attention on the profundity of her message. Matana Roberts’ work maintains a sense of ambiguity without falling into the violent erasure of abstraction. There is a multitudinous unity to her form, function, and ethos. The elements that make up each chapter of COIN COIN are not cannibalized or synthesized, but collaged – each constituent part allowed to be itself. Sometimes the ruptures between these elements are stark, other times they blend more subtly.